Although it is too ugly to be called art, it is perched on my office bookshelf. It’s a sculpture of the Nativity. I bought it in Mexico on my first mission trip. I buy ugly souvenirs. I don’t mean to, it just happens. I return from countries with outlandish artifacts. My wife says they’re horrible. She’s right. Once I had this great idea to buy clocks from each visited country. I was going to leave each clock set on its country’s time zone. It would remind me to pray for that field. So, I bought my first clock. It was an “Aztec” clock. “Aztec,” loosely translated, means “ugly.” My wife made me give it my mother. It was hideous! (The clock I mean, not my mother.) She put it in her laundry room. It’s very important to know the time when you are doing laundry. More importantly, the laundry room is a fine place to put ugly things. Regardless, I have kept my sculpture. Everyone thinks it’s awful, but I like it. Well, I don’t really like the sculpture. It’s just that it makes me laugh. The baby Jesus, in the manger, is a Mexican. 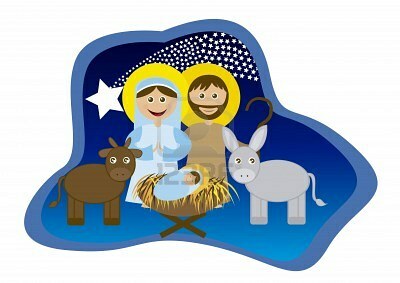 Mary and Joseph are also Mexicans. Behind the scene are the mountains of Mexico. Just behind Mary is a cactus. There is a cactus behind Joseph as well. Perhaps it is time to reread the gospels with fresh hermeneutic in order to see what we might be missing. Jesus might be a little easier for people to follow if we didn’t keep changing Him so much. As a child I knew Jesus to be a light-skinned, handsome, bearded, kind man. He avoided places like movie theatres and dance halls. He never made real wine. He wouldn’t even eat in restaurants where alcohol was served. He only listened to Sandi Patti and Carmen (especially “The Champion”), and he liked to remind people that hell was their fate should they be inflicted in an automobile accident. Today, Jesus is much more easy-going and friendly. Now they claim he would make real wine, and go to the movies if he was accompanied by an unsaved friend. Sigh. I wonder when our silly religious assumptions will become less important than our pledge to love people. As I write this, I’m sitting in an airport, delayed, sitting near a grown man who is playing with his children in the play structure. (The man I’m staring at is famous – an actor or musician or something. I recognize his face, but I have no idea who he is. Excited people are asking him for autographs. Airline agents are giving him extra care.) Other parents are just watching, but this man is playing. He is too big to fit in the play thing but it doesn’t matter. The kids are happy to have dad helping them avoid angry sharks that live in the airport’s faded blue carpet. He hops from chair to chair (I mean, life-raft to life-raft) to the delightful squeals of the children. It makes me think of Jesus. I look at this man and think about his departure from his comfortable environment – the place made for him – and his attempt to fit into someone else’s world. He doesn’t quit fit, but those who love him are delighted with the effort. He says to his kids, “I’m going to see if we can get a different flight. If we get home earlier that’ll be good news! And, if we can’t get home earlier, it’ll still be good news because we get to play longer!” That seems like Jesus. He left heaven for earth. He left eternity. Chose time and space. He came so that we could be with him a little longer – well, forever. Secondly, we must love. For whatever else Christians are known for, we are not known for our love. We must love harder and better. Love is a tremendous apologetic. Jesus loves the celebrity and the obscure. Philip Yancey wrote, “The more unsavory the characters, the more at ease they seemed to feel around Jesus. People like these found Jesus appealing: a Samaritan social outcast, a military officer of the tyrant Herod, a quisling tax collector, a recent hostess to seven demons. In contrast, Jesus got a chilly response from more respectable types. Pious Pharisees thought him uncouth and worldly, a rich young ruler walked away shaking his head, and even the open-minded Nicodemus sought a meeting under the cover of darkness. [How] strange this pattern seemed, since the Christian church now attracts respectable types who closely resemble the people most suspicious of Jesus on earth. What has happened to reverse the pattern of Jesus’ day? Why don’t sinners like being around us?” If we do not love, nothing else matters. “If I speak in the tongues of men and of angels, but have not love, I am only a resounding gong or a clanging cymbal. If I have the gift of prophecy and can fathom all mysteries and all knowledge, and if I have a faith that can move mountains, but have not love, I am nothing. If I give all I possess to the poor and surrender my body to the flames, but have not love, I gain nothing.” We must not judge. Religion can become judgment, and judgment is the enemy of love. If we judge people, we have no room to love them. Incarnation is an ageless miracle. Just like the celebrity who shrank himself to fit into a play gym, or Jesus who reduced himself to the size of a baby to redeem us, we are told to leave our usual environment and enter foreign lives – as pilgrims and strangers – and reflect an authentic Christ. It is possible to follow Jesus without embarrassing God. Update: The celebrity dude was Ethan Hawke.